Wakatobi guests Allan Saben and Erik Schlogl share a sample of their images, taken one day – from sunrise to sunset, during a visit to Wakatobi Resort. Hope you enjoy this photo essay and learn about some of Wakatobi’s interesting marine life subjects. 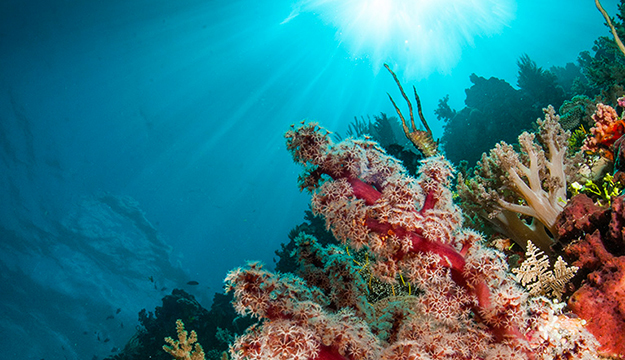 It’s a new day on the coral reef and the first dive on the house reef begins as the sun rises slowly overhead. It’s a peaceful moment, as the creatures of the night find their niche to sleep off their nocturnal activities, while the creatures of the day slowly wake up and rise. 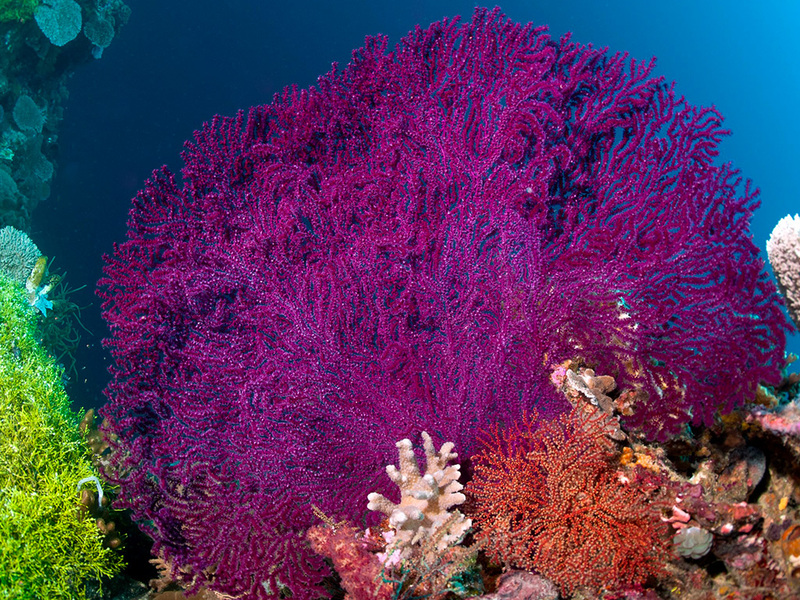 As the sun comes up, Erik captures this picture of a vibrant soft coral, swaying gently in the current. Having bagged his first image of the day Erik moves along and spots a parrotfish lazily emerging from its protective mucus cocoon and nighttime hiding place. Erik Captured the image as the fish prepared for another day of grazing the algae from the reefs, and peered out to check the horizon for a tasty patch of food. Predators lurking, already awaiting their breakfast, see no sign of this enigmatic frogfish, completely disguised as part of his surroundings. Looking like the sponge itself, it lives in perfect camouflage. Frogfish coloration varies from species to species, and even within the same species. Textures range from smooth velvety skin to algae covered warts, and even spots that look just like those of a sponge. As the sun rises higher in the sky, the divers find this lionfish as it hovers above the corals, looking for a tasty morsel to become his next victim. 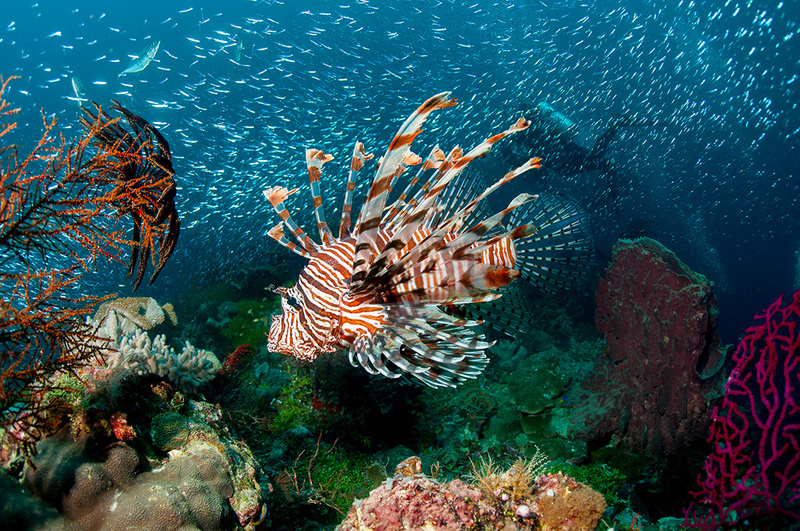 The Common lionfish is among the most beautiful fish on the coral reef. Vividly contrasting coloration warns predators away from its highly venomous spines. Lionfish are part of the family Scorpaenidae, scorpionfish. Most species in this large family are well camouflaged by flaps, tassels, and coloration matching the bottom terrain. But all the members of this family have one thing in common – they are all venomous to a greater or lesser extent. Venomous, yes, but only a danger to anybody who attacks them. 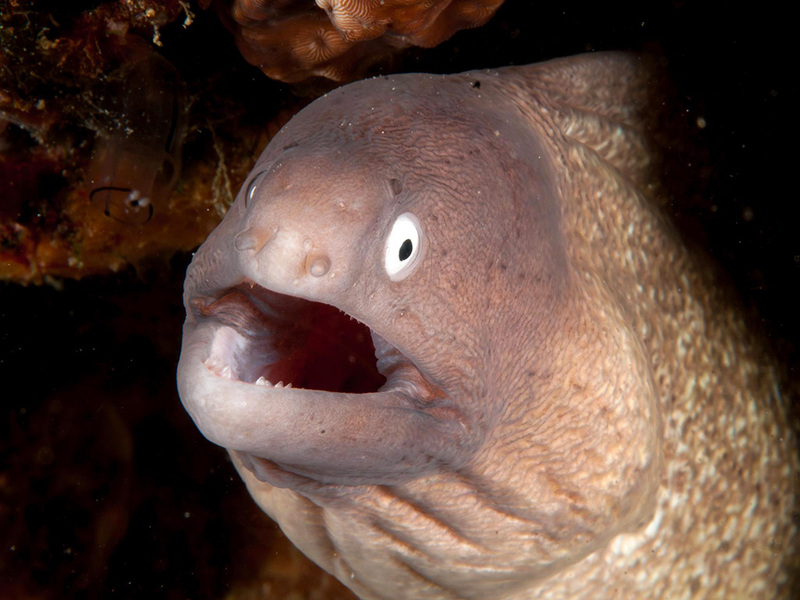 The sun is bright overhead and the white-eyed moray eel retreats into his burrow to await a darker moment and recommence his hunting. Erik captures him beautifully against his dark crevice. Meanwhile, further down the reef, Allan finds a nudibranch (Chromodoris Kunei) in full and fascinating behavior as it takes the time to lay a string of eggs. 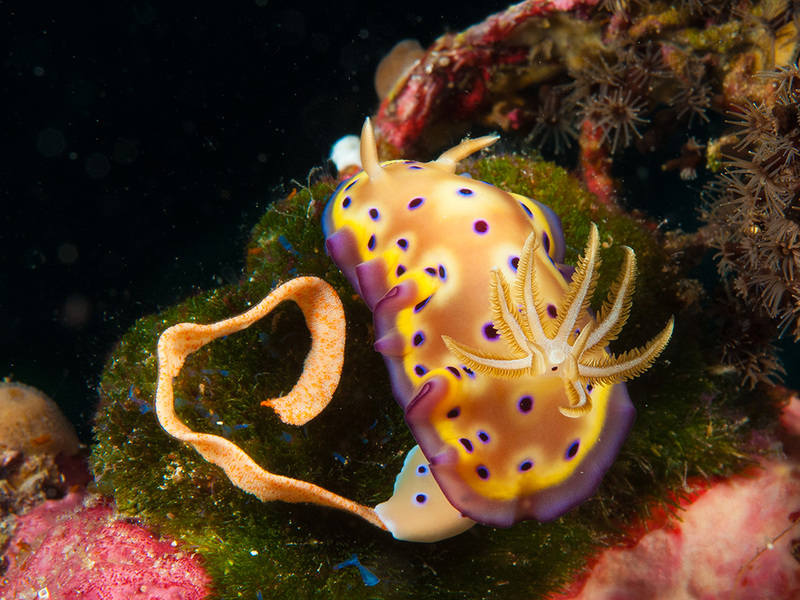 With the creation of nudibranchs, nature expresses its wildest indulgence of colors and forms. 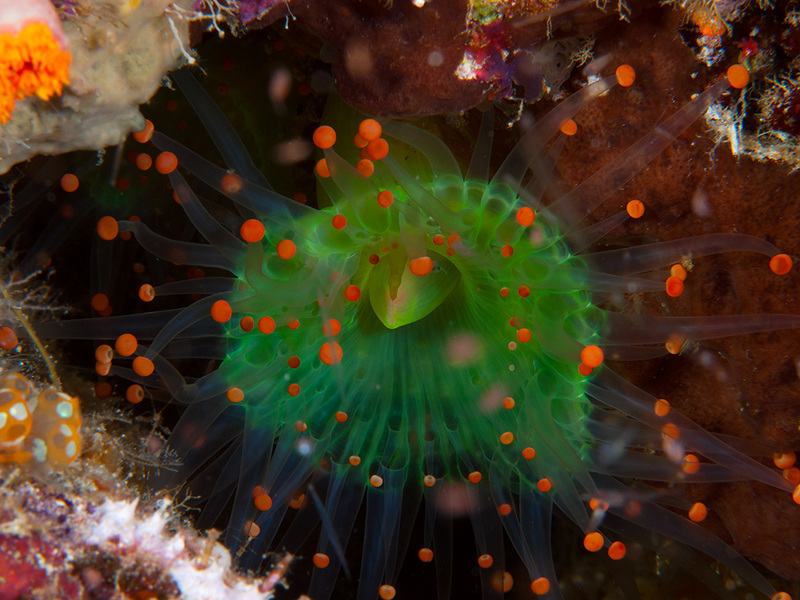 There are more than 3000 described species of nudibranch, with new ones being identified almost every day. Their size ranges from just a few millimeters to around 300 mm. They can be found in all the oceans of the world and within most habitats, but are more abundant in shallow, tropical waters such as Wakatobi. Even the egg ribbons can come in an amazing array of size, shapes, color and design, depending on species, and are usually laid on, or near food sources. 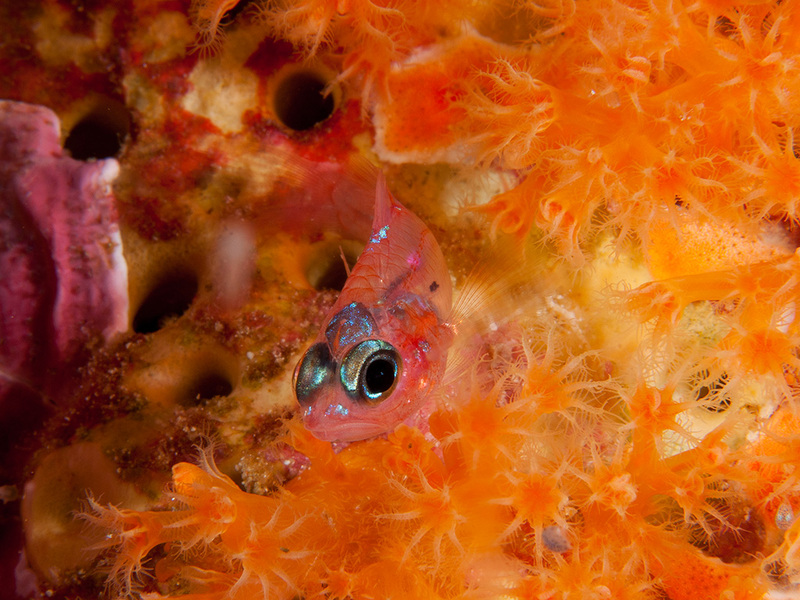 After just another short swim Allan spots a ghost goby and takes this colorful portrait. Often confused with Blennies, Gobies form the family Gobiidae, which is one of the largest families of fish, with more than 2,000 species in more than 200 genera. The most distinctive aspects of goby morphology are the fused pelvic fins that form a disc-shaped sucker, used like the dorsal fin sucker possessed by remoras to attach themselves to corals, stone and rocks. With such a translucent body it’s easy to see the goby’s internal organs, including its brain, that bright sparkling jewel just above its eyes. Giant sea fans gleam in the midday sun. 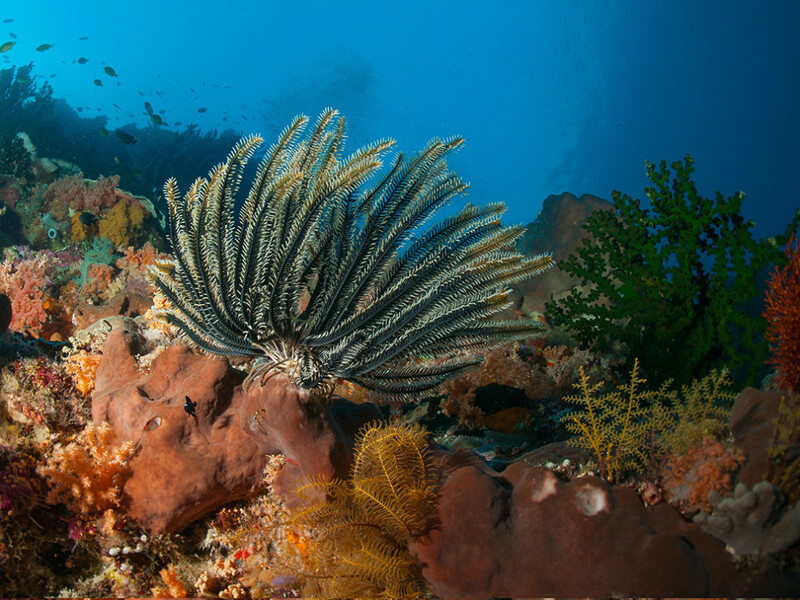 Home to a myriad of little creatures, sea fans are fragile and can be damaged or killed easily by misplaced fins, a gauge, or by mistakenly leaning a camera or strobe into it. But if buoyancy is good, the approach made carefully, and attention paid to make sure the fan isn’t disturbed when the diver moves backwards, numerous marine life treats can be found living within the fan’s branches. 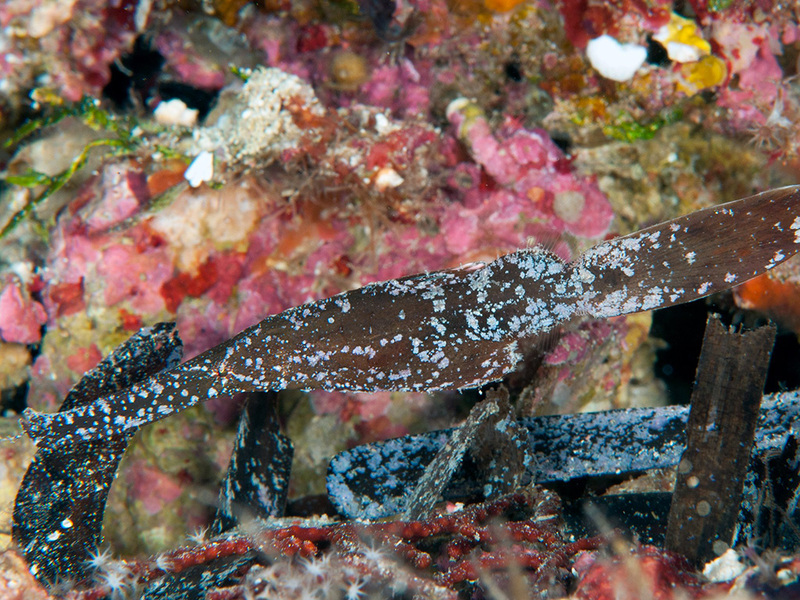 With expert capabilities of mimicking their host (such as crinoids, sea grass, algae, sponges, or gorgonians), it takes a sharp eye to spot a spectacular ghost pipefish. Allan’s private dive guide, having a keen eye for subjects on the photographer’s wish list, spotted this pair – and yes, there are two ghost pipefish in this image. Fishes best at camouflage generally tend to rely on their appearance, sometimes entirely, for defense. They mainly stay in one area, where they can blend with the background and go unnoticed. Most will remain as still as possible, trying to disappear in their camouflage. The big challenge is finding them! 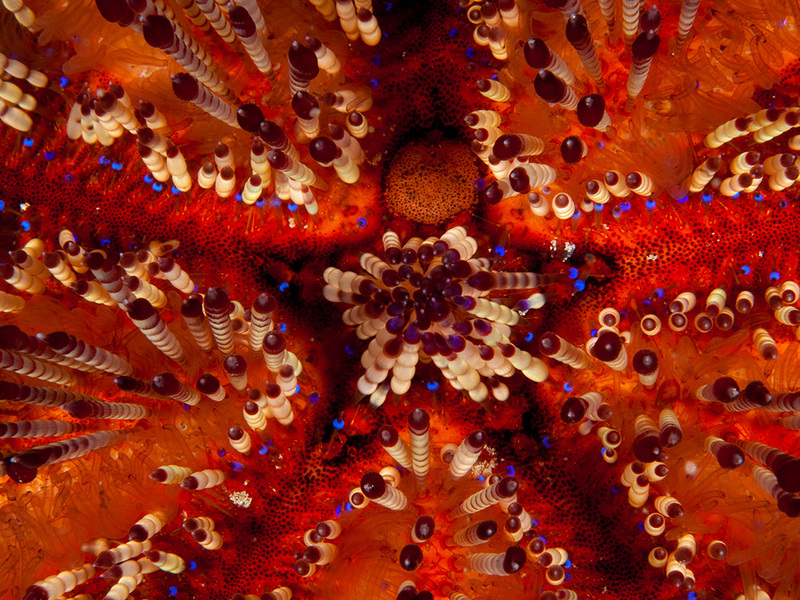 While a beautiful sight for the eye, the fire sea urchin not only has venom, it can also bite. It injects its venom in two ways. Its spines contain venom sacs, with the venom able to be injected directly into the wound through the spine; but it also has dozens of tiny jaws that snap shut on prey and inject the paralyzing toxin into its victim. Sea urchins are members of the phylum Echinodermata, which also includes sea stars, sea cucumbers, brittle stars, and crinoids. Like other echinoderms, they have five fold symmetry (called pentamerism), and move by means of hundreds of tiny, transparent, adhesive tube-like feet. Their tube feet are moved by a water vascular system. This water vascular system works through hydraulic pressure, allowing the sea urchin to pump water into and out of the tube feet, enabling it to move about. Sea urchins are sensitive to touch, light, and chemicals. Although they do not have eyes or eyespots, recent research suggests their entire body might function as one compound eye. Predators are triggerfish and large wrasses, which nibble away at their spines before turning them over to eat the fleshy undersides. Just before the sun begins to go down, Allan shoots a sea star (known as an Echinoderm) with a similar artistic flair as the sea urchin. The surfaces of sea star’s bear plate-like calcium carbonate components known as ossicles. These form the endoskeleton, which takes on a number of forms that are externally expressed as a variety of structures, such as spines and granules. These may be arranged in patterns or series and their architecture, individual shapes and locations, are used to classify the different groups within the class (Asteroidea). 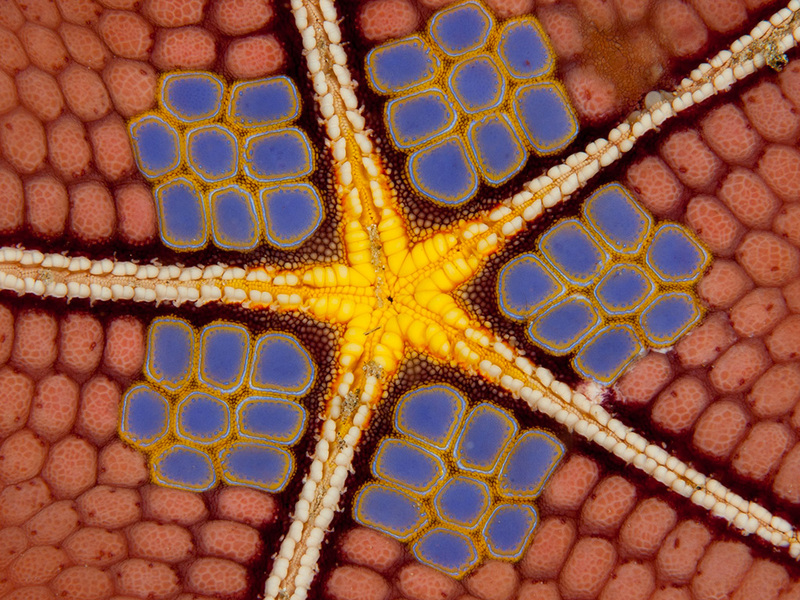 As echinoderms, sea stars possess a hydraulic water vascular system that aids in locomotion. This system has many projections called tube feet on the ventral faces of the starfish’s arms which function in locomotion and aid with feeding. Seen here on the oral surface there is a groove running down each arm. On either side of this there is a double row of unfused ossicles. The tube feet extend through notches in these and are connected internally to the water vascular system. The body cavity not only contains the water vascular system that operates the tube feet, but also the circulatory system. On the end of each arm is a tiny simple eye, which allows the starfish to perceive the difference between light and darkness and detect moving objects. When the sun sets on the reef diurnal creatures prepare to find a crevice to spend the night. As dusk, follows, however, the reef will experience a short, intense time of action, during which many residents choose their stage for hunting, mating, courting and spawning. As night falls, the two divers find the parrotfish has returned to his nook to turn in for the night, and Allan grabs one more photo of the day. Just as some people must sleep with nets to ward off mosquitos, parrotfish spin mucus cocoons before slumber to keep away biting parasites. The parrotfish secretes mucus from its mouth, which is used to create a gooey, protective cocoon enveloping the fish, and presumably hiding its scent from potential predators. This mucus envelope may also act as an early warning system, allowing the parrotfish to flee when it detects predators, such as moray eels, that attempt to disturb the protective membrane. Allan Saben is a Director at The Carkit Company in Sydney Australia, specializing in automotive accessories. Scuba diving and underwater photography are his passion. He says that after a hard years work there is no better reward than going on a dive trip overseas to special places like Wakatobi where the reefs are so rich in an abundance of marine life and corals. Some of Allan’s photography can be viewed at http://www.redbubble.com/people/allans and http://www.flickr.com/photos/allansaben. Erik Schlogl is the Director of the Quantitative Finance Research Centre at the University of Technology, Sydney, Australia. Scuba diving and photography allow him to get away from everyday stresses for a while. His photographs have been published in numerous books, magazines and newspapers, including Australian Geographic. More of his images can be found at eschlogl.redbubble.com, and many of his fish photographs can be found on the Australian Museum’s fish site, http://australianmuseum.net.au/Fishes. Inquire about a visit to Wakatobi here. Or email office@wakatobi.com.